Wright Industries, acquired by Doerfer Companies in 2004, produces automated assembly systems at its facility in Nashville, TN. 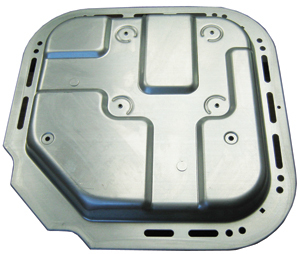 It recently faced the challenge of designing a transfer die for a part with a deep, contoured shape. Historically, the company’s engineers produced an initial design based on intuition and experience, built and ran the die, and then recut and reran the die until it worked as intended. This time, engineers used Pam-Stamp 2G software from ESI Group (through ESI North America, Bloomfield Hills, MI) to simulate drawing and forming. Simulations identified thinning problems that the engineers corrected using a software prototype, prior to building the die, and they also used simulation to determine the trim line. Doerfer supplies turnkey factory automation, tooling and automated-guided-vehicle technologies, and manufactures hydraulic presses, from 500 to 13,000 tons. Doerfer’s Wright Industries’ facility includes one of the largest tool and die facilities in the Southeast United States, according to company officials, building progressive, transfer and hand-operated line dies for customers in the agricultural, lawn products, appliance, automotive and HVAC industries. This computer-simulation screen shot pinpointed material-thinning areas of the part in the die. Excessive thinning is shown in red, mostly centered around small radii in the initial part design. After die designers increased radii, further simulation showed that thinning was reduced to an acceptable amount. Cutthroat competition and increasing part complexity drove Wright Industries to adopt simulation software. Pam-Stamp 2G covers the entire tooling process from quotation and die design through formability and tryout validation, including springback prediction and correction. The web-enabled technology allows the sharing of images, annotation, text and 3D models, so users can make decisions online, bringing together design engineers, material providers, die designers and tryout press shops from an early stage of the design right through to production, according to ESI Group officials. The previously described part slated for the transfer-die simulation measures 30 by 36 in. with a contoured shape and multiple levels that made production difficult. Wright Industries engineers developed an initial four-station die design. The first operation features critical drawing that forms the basic contours of the part. The second operation trims a excess material, the third restrikes and forms the part to its final shape, and the fourth operation pierces and cam pierces. The combination of a deep draw and a tight material allowance makes it difficult to absorb the stretch during the drawing operation without exceptional thinning. Wright Industries designed and built a transfer die to produce this complex part. 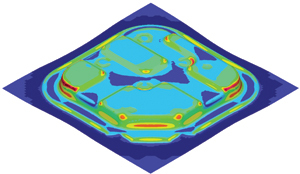 By using computer simulation of part forming, engineers optimized the die design without a costly and time-consuming trial-and-error process. On this project, engineers exported the tool geometry of the initial die configuration from Pro/Engineer computer-aided-design software into the IGES file format and then imported the geometry into Pam-Stamp. The initial simulation iteration discovered areas where the die would stretch the part beyond the capabilities of the material and cause tearing. Simulation pinpointed part-thinning areas of the part in the die, mostly centered around small radii in the initial part design. The engineers performed additional simulations —changing drawing depth, pressure on the binder and other variables—but were unable to correct the thinning problem. They then tried increasing the size of these radii and reran the simulation, improving the situation but not completely eliminating the problem. Repeatedly tweaking the part design and rerunning the simulation ultimately produced the ideal part. Because Doerfer and Wright Industries cannot change the part design without customer permission, engineers met with the customer and showed the simulation results indicating that the tearing problems could be resolved by increasing the radii. The customer approved the changes to the part and the engineers got back to the task of designing the rest of the die. The next step was to determine a developed trim line for the second operation. The goal: Leave sufficient material to make the trim feasible, but as small of an amount as possible to reduce material costs. Since the third operation actually formed the part to its final shape, it was necessary to jump ahead to this operation to determine how the part should be trimmed in the second operation. Engineers used the Pam-Stamp inverse-solution feature that estimates blank size based on finished-part size. “The inverse-solution feature does not provide 100 percent accuracy, but it is much more accurate than the traditional method,” Veach says. The engineers then went back to the second operation, setting up the die to trim to the line determined by inverse simulation of the third operation. No simulation was required for piercing in the fourth operation. This application demonstrates how computer simulation has helped Wright Industries offer competitive prices and quicken delivery time.